Hi, I’m Heather. I’m 24 years old. I’ve always been active. I played basketball in school and I did weight training. I did Crossfit for about two years and just recently got serious about powerlifting. I’ve competed in crossfit, strongman and powerlifting so far. 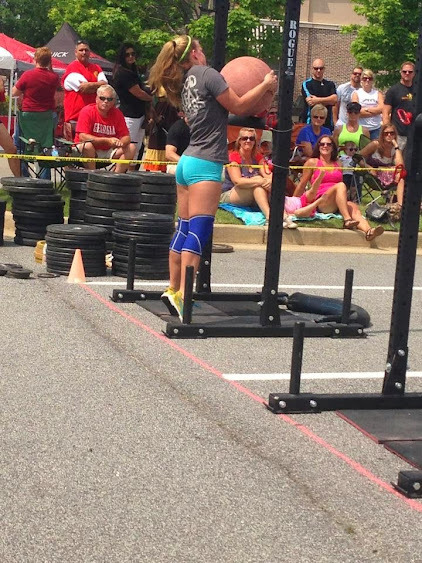 I live in Locust Grove and I train at Crossfit Clash. I would have a fishing pole, fresh water supply and books. I admire Camille LeBlanc Bazinet. She is strong and beautiful and she is a great role model for young girls and women. She has a great attitude and has fun while training. That’s what it’s all about. Well, most people don’t know that I like to put peanut butter and jelly on my cheeseburgers. It is so good! I would ask Abraham Lincoln if the play was worth it. I am a store manager for Nutrishop in McDonough. My hours are flexible, so it doesn’t interfere with competing. I love to squat and deadlift, so I started a program that would help increase my numbers. I had no intention of competing until I came across a competition that was geared towards first time lifters and crossfitters. I thought what the heck, so I signed up and now I’m hooked. I’ve been competing for less than a year. In competition my squat is 242, bench is 132 and deadlift is 308. Total is 683. I currently hold 4 state records in the 123 wt. class for squat, bench, dl and total. For me, placing top 6 in my first national meet was a huge achievement. My training philosophy is to just get it. During heavy sessions I have to mentally prepare myself because I have a bad habit of getting in my head. I usually bench multiple times a week and squat/deadlift once a week. I compete unequipped in the open division. I compete in the 123 and 132 wt. classes. My favorite lift is the deadlift because all you do is pick it up and put it down. My mind. I have a lot of potential but I mentally beat myself up. So if I conquer my mind, I’ll succeed. I haven’t been involved in powerlifting long enough to determine this. 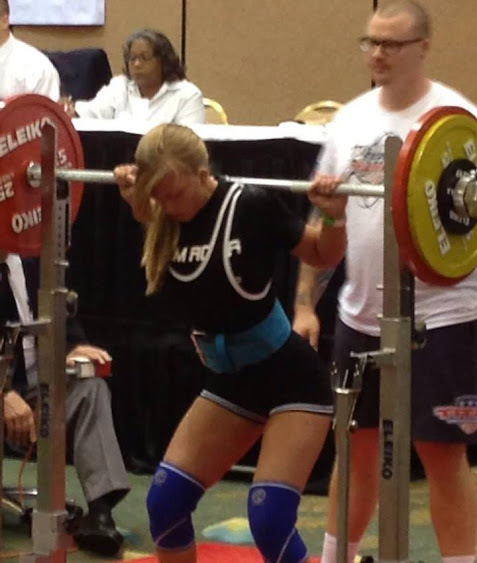 My last meet was Raw Nationals in Orlando, Fl. It did not go well at all. I didn’t make weight by 2 pounds so in my mind I was already a failure. I went 5 for 9 on my lifts. However, I still managed a 6th place finish in my first national event and only my second competition. So it wasn’t a complete fail. My next meet is the Georgia and Southern States Powerlifting Championships on November 9th in Norcross. To prepare I usually just follow my program and I alter my diet the month before to make weight. I will practice the commands more. This is only my first year, but after November I will have 3 under my belt. Very much so. Powerlifting has given me a feeling of accomplishment. It has given me so much more confidence in myself, but it has also humbled me. I’ve also had the opportunity to meet a lot of great people. 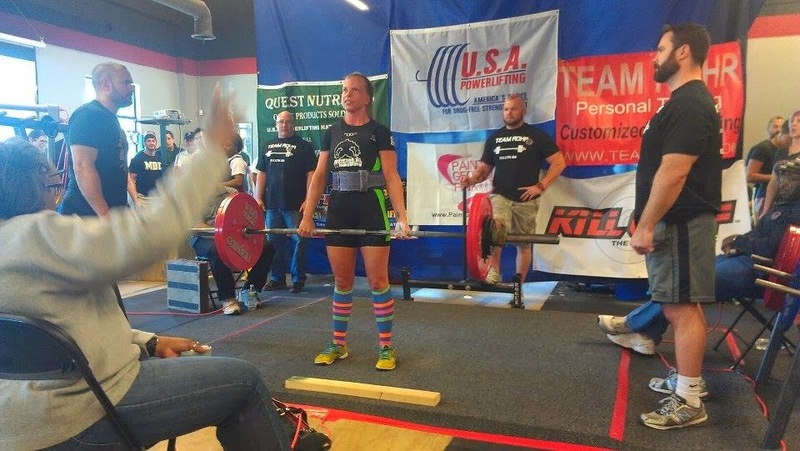 I suppose my most prestigious meet would be Raw Nationals, however, my first competition Powerlifting for Pink is the one that sticks out most in my mind because I set 4 state records in that competition. I compete in Strongman and Crossfit. My favorite memory is from my first competition when I pulled 308#. Most definitely! My goals are just to constantly improve, get stronger and help others do the same along the way. Something interesting… I usually weigh between 135-140. For my first competition I registered for the 132 wt class. I did the whole water manipulation thing and the day before my comp I was 133. I was so nervous about weighing in that I was trying not to even swallow my spit. Ha. So I go to weigh in and the scale says I weigh 121. I still don’t know how that happened. That’s not really interesting but that’s all that I have. Ha. An elite total or a 300# squat! I have to thank my boyfriend and training partner CJ, he makes sure I’m up at 4am to go train and he always pushes me and has confidence in me. I have to thank Josh Rohr for the awesome programming. 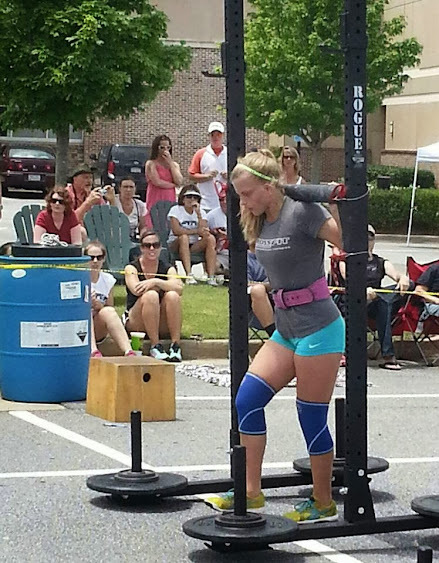 And I have to thank crossfit Locust Grove and Crossfit Clash for allowing me to do my powerlifting in the gym.